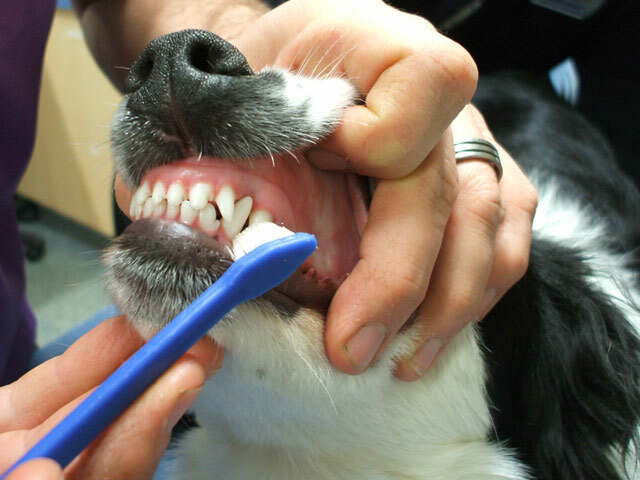 Pet dental health is vital to overall health and quality of life of your dog or cat. Without preventive dental care, dogs and cats can experience gum inflammation, infection and pain, and tooth and bone loss. Over 65% of cats and 75% of dogs over the age of three have some level of periodontal disease. When dental care is left untreated, advanced periodontal disease can lead to other health conditions like heart disease. A study conducted by Purdue University in 2010 showed that dogs affected by dental disease had higher rates of heart disease. Often dental problems are not easily detected by simply looking in your pet’s mouth. More serious conditions can go unnoticed because, unless you observe a change in your pet’s behavior, pets cannot tell us when something is wrong. Case in point, a dog came to Doylestown Veterinary Hospital & Holistic Pet Care for an examination with concerns about bad breath and a possible tooth extraction. A thorough examination of the dog’s mouth revealed a tumor under the dog’s tongue. Good pet dental care starts with prevention, which includes a multi-stepped approach from daily care to professional care. To keep the mouth healthy and the smile bright, regular brushing with pet-specific toothpaste is an important part of pet dental care. A brushing routine can be started at any time, but beginning at the puppy or kitten stage is recommended. Ask your veterinarian for help in establishing a brushing routine. Proper nutrition and high-quality foods go a long way for overall health, which includes good dental health. Despite popular thinking, feeding dry kibble is not only answer to good dental care. There are a few prescription dental foods that, when fed as the majority of the diet, will help to keep the teeth clean. Foods and treats that promote dental health may also contain natural enzymes that help break down the bacteria in plaque that leads to destructive tartar. Look for the Veterinary Oral Health Council (VOHC) seal on any treats, food or other dental aids. This certification process assures the products actually work! Probiotics and supplements are natural choices that provide benefits. When there is an imbalance in gut bacteria, the bad bacteria can flourish causing infection and inflammation, resulting in periodontal disease and bad breath. “We now have options to help combat the destructive bacteria that cause abscesses and infections in the mouth. Beneficial bacteria from a probiotic supplement can aid in mouth and throat health, and establish a healthy oral flora that competes with the destructive bacteria,” said Dr. Laura Weis, owner of Doylestown Veterinary Hospital & Holistic Pet Care. The right toys and chews can support good dental health, so choose hard rubber toys such as a KongTM or shapes with ridges or a nubby texture for pets to chew on. Raw bones can be a good choice, but they are not without risk; hard bones can cause teeth to fracture. Never give cooked bones to your pet. Cooked bones are dry and soft which can lead to dangerous splintering and breakage. Consult with your veterinarian about what kind of bone is appropriate for the size and breed of your dog. Anesthetic-free dental cleaning for your pet is a safe, cost-effective option for preventive dental care. It’s a cost-effective way to remove tartar and plaque from your pet’s teeth. 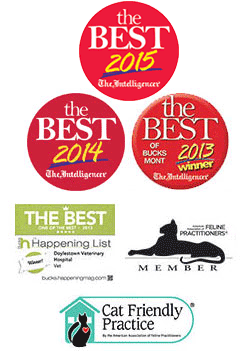 Doylestown Veterinary Hospital & Holistic Pet Care offers this service through Pet Dental Services (PDS). The PDS technicians are highly trained in cleaning the teeth of dogs and cats without the use of anesthesia, and they are trained to recognize abnormalities that should be discussed with the veterinarian. Dental radiographs will show problems in the tooth or under the gum line that cannot be detected with a simple look in the mouth. A professional cleaning can remove plaque and resolve problems like cracked, loose, or rotting teeth. Schedule a dental exam and professional cleaning with your veterinary practice. A healthy mouth supported by preventive pet dental care is a win-win for you and your dog or cat. As always, consult with your veterinarian about your pet’s dental-care routine, including brushing, supplements, toys, and professional care. Doylestown Veterinary Hospital & Holistic Pet Care offers comprehensive care including preventive pet dental care and oral surgery for dogs and cats. The practice also offers non-anesthetic dental cleanings through Pet Dental Services for dogs and cats that qualify.